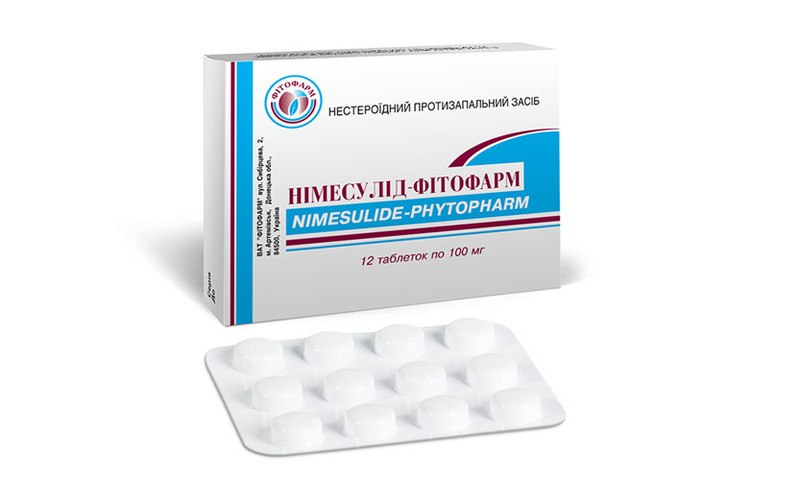 1 tablet contains: nimesulide 100 mg; dopomozhni ingredients: lactose, monohidrant; microcrystalline cellulose, colloidal anhydrous silica, povidion (polyvinylpyrrolidone), croscarmellose sodium, magnesium stearate. Tablets. 12 tablets in a blister pack in. Treatment of acute pain, primary dysmenorrhea. Nimesulide should be used only as a second-line drug product. The decision on the appointment of the drug product should be taken on the basis of all the risks to the patient. The drug product is taken orally after a meal and drink plenty of fluids. Adults. The recommended dose is 100 mg 2 times a day after meals. Patients older. Dose adjustment is required. Adolescents aged 12 to 18 dose adjustment is required. The dosage is the same as for adults. Patients with impaired renal function. Due to the pharmacokinetics of the drug product to patients with mild to moderate renal insufficiency (creatinine clearance - 30-80 mL / min) change the dose required. In severe renal insufficiency (creatinine clearance <30 mL / min), the drug product is contraindicated.